Adam “Batman” West, his family and the Dark Knights at a pre-state fair party in St. Paul. 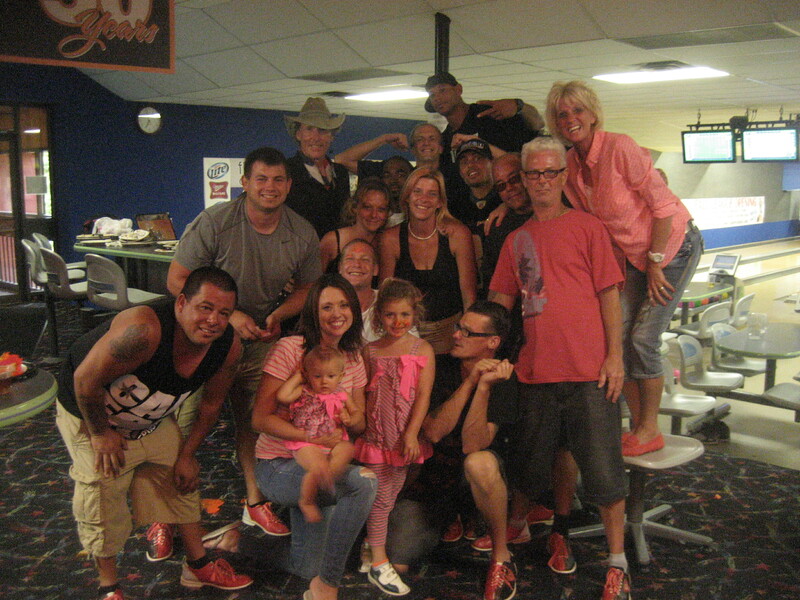 He is second from the left, in the grey t-shirt. Adam West’s favorite carnival moniker and icon was chosen for him when he was born, given to him by his carnival games owning parents. Named after the actor portraying the 1960’s TV hero Batman, Adam grew up in carnivals. Now that he was a young games owner, he put the iconic black bat on his Batmobile golf cart and on his Batcave, a carnival supply/office trailer. He gave Batman rings and Batman shirts to his crew. At 28 years old, the former high school football star was divorced and remarrying when I met him and his crew, Batman’s Dark Knights. Batman joked about his wild days and nights in Mexico. He soaked in the lore of the wild nights of his father’s generation of carnival owners. He waxed lyrical about his childhood with carnies and growing to be a tough teenager who could beat-up other carnies, even the South African migrants, in traveling boxing matches. With his ex-jock frame, he was a dynamic, fast-taking, fast-counting success on the traveling carnival circuit. His plush were the latest, hottest items. His games were old world stingy, tight. His crew was the strongest. On the Super Midway at the Minnesota State Fair in St. Paul, I asked for a job and he wanted to know if I had the right stuff. The exchange was typical of the speed and carnival justice of the American carnival Batman. I laughed and said, yes, no and yes. In that short exchange, I was hired to work games the two biggest state fairs in America, Minnesota State Fair and the State Fair of Texas. We worked the Oklahoma State Fair in between, which claimed to be the World’s Biggest Carnival. I ran pool tables, a shark pool, a basketball game and the Tubs of Fun for more than two months in Batman’s crew. I called the crew Batman’s Dark Knights because every man and woman was admirable to me and every one carried dark secrets. The knights of the round table, this carnival crew was not. They were knights of the open road. They were so good, one boasted, “we don’t leave a dime on the midway.” They were avarice knights, greedy for a money, wild nights and life. When Batman’s Dark Knights walked the midway, mammon walked the midway. On Freaky Friday Videos, my video shows clips of the three state fairs and crew members. At the end is a tribute to Patrick White, who died of a heart attack in Texas. We were all thunderstruck when the 29-year-old who ran the Break-a-Plate suddenly shattered and died himself. You’ll see parties, games, high times and hints of the secrets of the Dark Knights are all there. Walk the midway with Batman’s Dark Knights. From 2013-2014, I worked rides and games in California, New Jersey, New York, Chicago, Alaska, Minnesota, Oklahoma, Texas, Georgia and Florida, where he worked in a freak show but didn’t get on stage because they didn’t see the inner freak in him. He rode a bus into the mountains of the Sierra Madre Oriental to a Mexican village that empties of men each year, going north to US carnivals. Living on carnival wages, I hitchhiked 15,000 miles across 36 states. My blogs appear in Huffington Post and at www.EyesLikeCarnivals.com. Agent Tim Hayes is seeking a publisher for the book.